Artist Exchange International presents Through Our Eyes: Wuppertal/New York at The Painting Center from January 29 to February 23, 2008, with a slide-illustrated panel discussion at The Metropolitan Museum of Art. Four artists from Wuppertal Germany and five artists from New York City partnering with The Metropolitan Museum foster cross-cultural exchange by bringing the past into dialogue with the present. The exhibition centers on the permanent collection at The Metropolitan Museum from which each artist has made choices in the context of their own work. The exhibition Through Our Eyes brings together established to emerging artists from Germany and New York City as its core sample. The exhibition crosses current events and past history seen from two perspectives. The African-American artist Romare Bearden's improvisation between ad and story inspire the German artist Jorgo Schäfer, while American Marsden Hartley’s “Portrait of a German Officer symbolically crossing the line stirs NY artist Michael Zwack. Bada Shanren of the Chinese Qing dynasty is caligraphically in sync with New Yorker Katy Martin's painted bodies that question borders between states; and an Egyptian Coptic carpet revives the commonplace in Wuppertal's Erika Windemuth. The relationship between European and American art is reflected in the choices of German artists Nicholas Stiller, Georg Janthur, and American artists Arthur Simms, and Shazzi Thomas. The exhibition tracks the nature of creativity in action: the exchange of ideas and the value of dialogue that has existed among artists overtime. Site Specific Installation After the opening reception at The Painting Center at nearby Petrosino Park, the site-specific installation Apkallu by Jo Wood-Brown will be projected from 8-10pm. 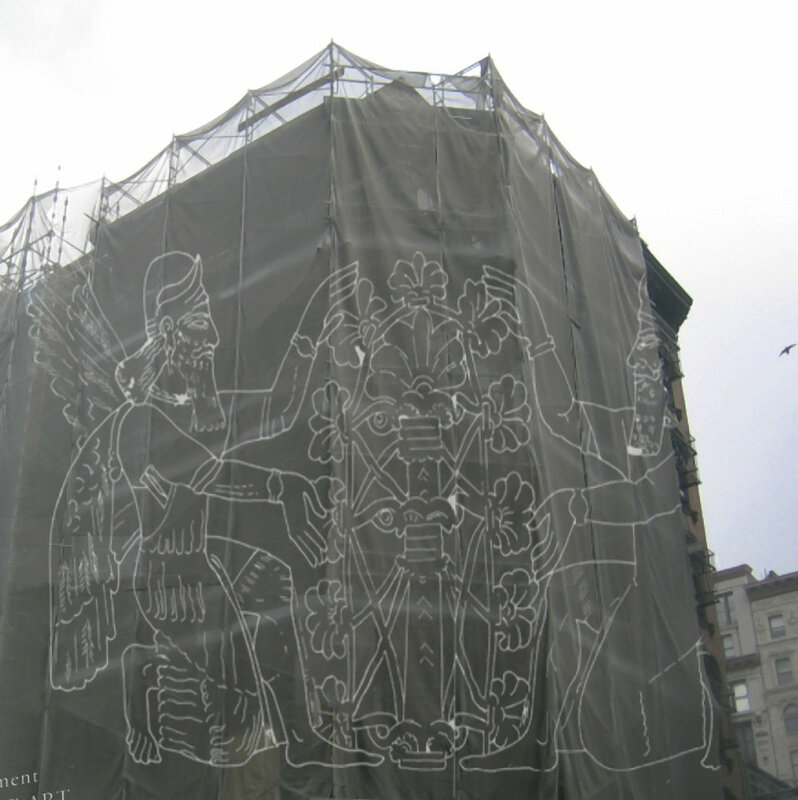 A relief of the Tree of Life from the palace of the King of Assyria (883-859 BC), modern day Iraq, is radically transformed some 30 feet tall on the background of New York City.